I’m always eager to show you examples of true American artistic originality! One such form in architecture is the octagonal house. During a period in architecture that was completely dominated by revival of any style you want to think of from the past, including ancient Egyptian, the octagonal house was a true innovation. In my mind, it could be considered a forerunner of Frank Lloyd Wright’s idea about integrating the interior of a house with the exterior surroundings. Fowler’s background was in phrenology, the study of the shape of a human skull and its affect on the health of an individual. Although he never studied architecture, in keeping with his interest in the health of Americans, he promoted the style for its health benefits. Two design elements of the house made his point: the omnipresent cupola allowed more light into the house over the central stairs; and windows in eight directions encouraged the moving of air through the house. He also advocated for “modern” amenities such as dumbwaiters, speaking tubes, and indoor toilets. 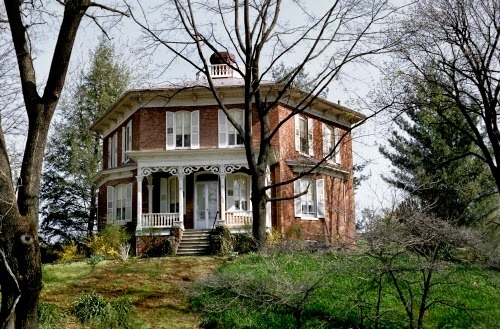 Fowler truly believed that the octagonal house was an economic way to serve the needs of the middle class. In his book he gave tips on how to keep costs low. However, most octagonal houses were built of the finest hard woods, which, in today’s building market, would have been astronomically expensive. Fowler’s book, though, ignited a fad for octagonal houses across the country. 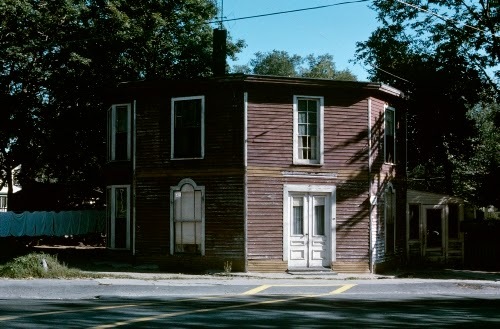 Although the initial fad peaked between 1848 and 1885, octagonal houses continued to be popular for people who owned a bit of property, and to the present day because of the light from eight directions, and the greater interior space (when compared with rectangular or square designs). Because octagonal houses peaked in popularity during the period of American architecture when every past style under the sun was applied to both domestic and public architecture, there is a wide variety of ornament on them. Some are truly plain but most of them share the common features of the cupola, which was an integral part of the Italianate Style (flourished 1840–1880). The San Francisco example comes complete with Italianate cupola, but has restrained Classical Revival elements scene in the pedimented porch, and decorative quoins. Quoins are the faux-brick decoration of the corners of the octagon (quoin means corner in French). Otherwise, it’s a simply elegant building. Here are some further examples of octagonal houses. 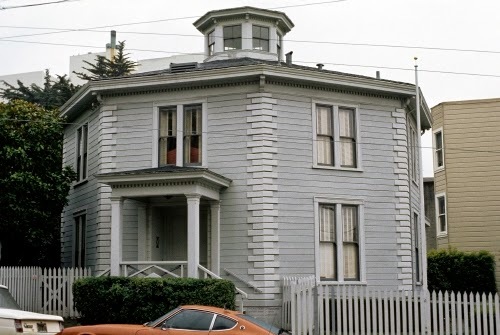 This house has predominantly Italianate features, including the cupola, tall first floor windows with wrap around porch, rounded arch windows, and a prominently projecting eave. Unusual in this example is that each face of the octagon has it’s own peaked gable. This example is most likely what Fowler had in mind when he held up the octagonal house as an inexpensive home for everyone. This house has the unfortunate later addition of a porch in back. 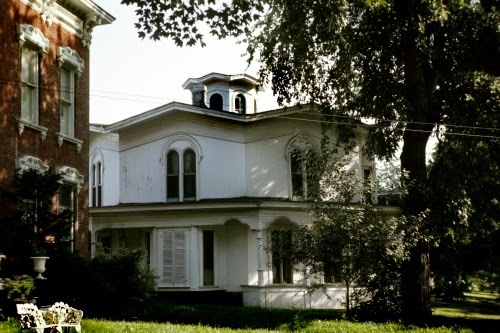 Visible in this example are the cupola and bracketed, overhanging eave of the Italianate style. The gingerbread jigsaw ornament of the porch may be a later addition, influenced by the Eastlake Style that flourished 1870–1890.